Talking about feelings, relationships or difficult experiences can be very uncomfortable for people. A cascade of stress hormones can be released by our brain when these topics are raised, especially if trauma is present. Have you noticed that our hands are often clear indicators of discomfort? Whether it is balled fists, hands thrust deep into pockets, nervously rearranging hair, biting fingernails, flicking, tapping or picking—our hands speak volumes. Sometimes, having an object to squeeze, handle, move, arrange, toss or catch can help calm our brain and soothe our body. Physical actions like these can provide just the right amount of distraction and help us transfer some of the internal intensity from inside to outside. They open up different neural pathways, helping our amygdala’s stress responses to dissipate and our higher brain functions to kick in so that we can reflect and communicate more thoughtfully. It is not surprising, then, that tactile tools have been used to enhance human service work for many years. They can include things like soft toys, balls, figurines, puppets, dolls, clay, sand trays, card sets, stickers, musical instruments, cultural or symbolic objects and objects from the natural world such as stones. 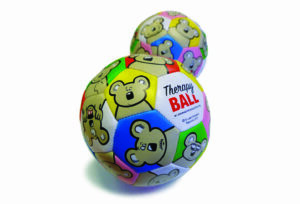 Tactile resources are especially effective for visual and kinesthetic learners. 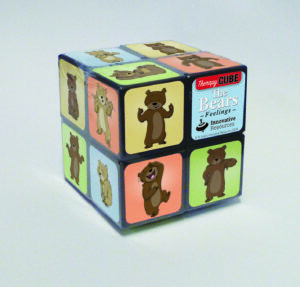 Innovative Resources has recently released a number of new tactile resources including a rubix-style Therapy Cube with 23 Bear characters, a set of 5 squeezable Bears Tactile Characters, and a soft, colourful Therapy Ball with 30 very cool Koala characters. 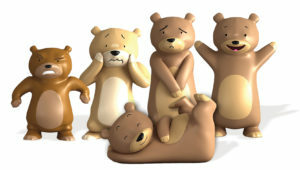 Each of these tactile resources is designed to help get ‘feelings conversations’ rolling with kids, young people and adults. Try out some of the ideas on our website for using these resources in your work. Or invent your own games and help bring a little light-heartedness to conversations about serious stuff.